Join us as we take a tourist’s glance at the nebulous between-world of spring football, so often neither footbally nor springy. First up: The home league of the reigning national champs. Who All Is in the ACC This Year? Don’t act like you don’t have to use a mnemonic device for this. You’re not better than us. Florida State: Do You Believe in Unlikelihoods? The Seminoles have positions of concern (defensive tackle, which loses multiple major contributors from last year’s squad) and curiosity (tight end, where preseason injuries and a transfer shelved so many known quantities before last season even began), but we’re most interested in seeing what balance the team strikes on offense this spring. Jameis Winston will be working with a receiving corps that’s about to feature Rashad Greene and a fresh cast of characters. And what is ACC championship game highlight star Karlos Williams going to show us next? And then there’s the garnet-and-gold champagne problem: the little matter of playing in the shadow of a national championship win. When we first started examining what made the Seminoles successful last season and considering what first steps they might need to take this spring to stage a repeat run, we kept circling back to their good fortunes on the field. No team wins a championship without help from the fates, and as special as the Noles looked last year, they also looked especially lucky. When we noticed Tomahawk Nation proprietor Bud Elliott expressing similar sentiments, we cornered him for a chat. Something I’ve been thinking about a lot lately, looking back on 2013, is how so much of a given team’s season is out of that team’s control. You can’t dwell on that too much without diminishing a program’s body of work, but I can’t get over how good FSU had it last year. I think the magic to FSU’s season was you had to replace more players drafted than any other school, you had to replace six or seven coaches, and then you had a new freshman quarterback coming in off a redshirt. And they were at a position where if certain injuries had occurred, they would’ve had to play walk-ons at offensive line. And every once in a while, a team just doesn’t have any injuries. They lost a starting safety in Game 2 or 3. And that’s it! After that, nobody went down for more than a game. So their depth issues that they had, in what was supposed to be kind of a transition year, just never got exposed. But like you were saying on Twitter, it’s difficult to quantify that effect, and/or to talk about it without taking away from FSU’s level of play last year. I think one of the problems, when we talk about luck, is that people kind of conflate that with the word “lucky,” and they use that to mean this team was undeserving. To me, when I use luck, I mean factors that are beyond their actual control. So between roster turnover and the incredible unlikelihood of catching that many good breaks again, do we need to temper our expectations for FSU in 2014? I don’t think any team should expect to win the national championship. But there are certain teams you can expect to be in the discussion, and I think this roster fits that. Jameis coming back, I don’t know how I could really overstate that. It’s huge. They lost a lot of really important leaders, more so on defense than offense. But who’s going to be the guy who’s going to go door to door at 6 a.m. and say “Let’s go”? That’s really important. I think last year, that team had a lot of that. I think they have the talent to replace almost everybody, playwise. I don’t know if they have the same kind of biblical-fire leaders. You lose Telvin Smith, and [Lamarcus] Joyner, and [Timmy] Jernigan, that’s a veteran leader of each position group on that defense. It’s that age-old story we all learned at our grandparents’ knees by the fireside of a winter’s night: Clemson has to replace its historically prolific quarterback, star receiving tandem, and thousand-yard running back, and its 2014 schedule includes a season-opening road date at Georgia and a Week 4 visit to the defending national champs’ home field. The Tigers’ 2013 season ended on a citrusy note of glory, but that September 20 trip to Tallahassee will loom large and doomful after last season’s encounter, which was the most exacting evisceration we’ve ever seen in real life on a football field. When last we saw the Blue Devils, they were coming off a bad, bad loss against FSU in the conference championship game and taking on Johnny Football in his final collegiate performance, where they helped put on a show that necessitated the creation of the unfortunately gawky phrase “a Chick-fil-A Bowl for the ages.” And despite ending a historic campaign on a losing streak, there’s an optimistic air of “now what?” around the program. That attitude’s likely to continue well into the first month of the season, with 14 starters returning and Elon, Troy, Kansas, and Tulane the Blue Devils’ first four opponents, three of them in Durham. With one of the nation’s only healthily functioning two-quarterback systems returning intact and the team’s best receiver and three offensive line starters also back, our curiosity is turning to development on the opposite side of the ball. Having five of the team’s top six tacklers return is a fine thing, but the unit as a whole ranked near the bottom of the conference in yards allowed per play in 2013. 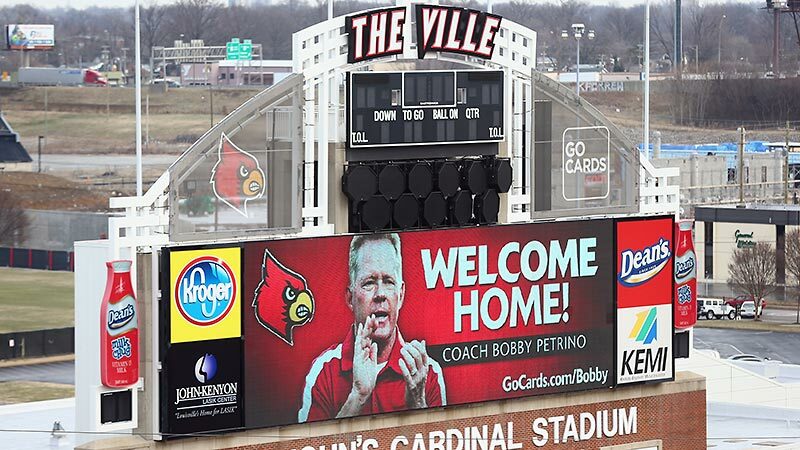 Bobby Petrino is good at three things: winning football games, collecting polo shirts in various shades of red, and making sharing space in a room with him deeply uncomfortable. Now back with the Cardinals, he can do all three! Follow your bliss, man. The plot for the 2014 Cardinals is clearly delineated already: new conference, new coaches, new quarterback. That, and a high-profile game right up front to see just how it’s all fitting together: Where last year’s Louisville squad spent September playing Ohio, Eastern Kentucky, Regular Kentucky, and FIU, the 2014 edition gets to open the season in the prime-time Labor Day slot against Miami. …aaand after that it’s Murray State, Virginia, and FIU again. So the schedule is bearable, and after the Canes leave town, there’s a long runway on which to tinker with whatever’s not working. The opportunities to capture national attention via ACC scheduling are also nicely spaced out throughout the season: After Miami, Louisville faces Clemson on October 11, Florida State on October 30, and conference stepsibling Notre Dame on November 22. Falling off the radar won’t be the problem it was last year. For Louisville to stay in the news in a positive fashion, our ace research team has concluded that the Cardinals will need a football team, and while we’re loath to fall right back into another quarterback-replacing discussion, it’s Teddy f’ing Bridgewater they have to replace. In the mix this spring: redshirt freshman Kyle Bolin, sophomore Will Gardner, juco import Brett Nelson, and incoming freshman Reggie Bonnafon. Of greater concern, if lesser attention, may be the defense, which returns just four starters from last year’s underrated unit and will be adapting to a new coordinator, Georgia acquisition Todd Grantham. Hey, Denzel Perryman’s coming back! What a handy excuse to post this Denzel Perryman clip! Sorry, people who have to spend next season being chased by him! Right, so: When pondering Miami football in 2014, an immediate, tangible question and a vague, fuzzy question come straight to mind. The first is a shrieking klaxon of IS DUKE JOHNSON ALL RIGHT PLEASE LET DUKE JOHNSON BE ALL RIGHT DUKE JOHNSON IS A DELIGHT TO WATCH HOW IS DUKE JOHNSON DOING? The second is simply wondering where the Hurricanes fit in the ecosystem of Florida football, with FSU in the stratosphere, Florida in the swamp (sorry), and Central Florida going off and winning BCS games? Johnson won’t practice in the spring as he continues to recover from the ankle fracture he sustained last November against Florida State. And with Dallas Crawford’s move to safety, run game–seeking eyeballs should fall upon Gus Edwards and Walter Tucker. Also on the docket: replacing Stephen Morris. (If we told you Winston was the only returning quarterback in the league this year, you’d have to think about it for at least a minute before correcting us, right?) DID YOU KNOW that Miami football has been hoarding a QB named Gray Crow, the most Game of Thronesy college football name since X’Zavier Bloodsaw? As to the Canes’ place in the Sunshine State’s food chain of domesticated pythons turned loose on an unsuspecting public: reply hazy; try again later. Miami’s been so uneven that it’s difficult to get a read on the Canes even for the purpose of baseless speculation. Who’s That Guy is an orientation tool for use in college football’s vast landscape, and is filmed in front of a live studio audience. • Who Is He? New Virginia Tech quarterback Michael Brewer. • Where Is He From? Lake Travis, Texas. That Is a Famous School! It is! In addition to Brewer, the program has produced quarterbacks Todd Reesing, Garrett Gilbert, and Baker Mayfield, Brewer’s former college teammate. • Years Played: Brewer saw action in 13 games over two seasons at Texas Tech. Wait, That’s a Different Tech. Stay with us for a minute. • Follow the Bouncing Ball: Texas Tech’s 2013 quarterbacks all run together in the haze of memory, but recall that Brewer was the guy who injured his back last offseason, setting off the last-minute quarterbacking race between Mayfield and Davis Webb. Brewer opted for a transfer after never making up lost ground on the depth chart, and will have two seasons of eligibility in Blacksburg. • Bio Tidbit: Just going to leave this here: “… bloodlines are full of Big 12 football talent, including father, Robert, who played quarterback at Texas, grandfather, Charlie, who played quarterback at Texas, uncle, who played quarterback at Texas, great uncle, Robert, who played quarterback at Texas Tech and great uncle, George, who played running back at Oklahoma.” Texas! • Should We Know Him? That depends on whether he wins the starting job; there’s a thorough breakdown on The Key Play that assesses the likelihood of Brewer winning out. Who's That Guy? Florida's Chris Walker!